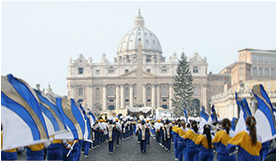 The route begins at Largo Giovanni XXIII, a square next to Castel Sant’Angelo, then follows Via della Conciliazione down to St. Peter’s Square. After the Concordat was signed in 1929 between Mussolini and Pope Pius XI, this street was created to link the capital of Italy with the Vatican State. At one end lies Castel Sant’Angelo. At the other, St. Peter’s Square opens before you. 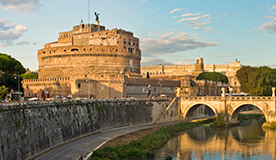 This medieval ‘castle’ was originally built as a mausoleum for Emperor Hadrian around 138 AD and is now a fortress, complete with the famous corridor that acts as a safety passage for the Pope to the Vatican. 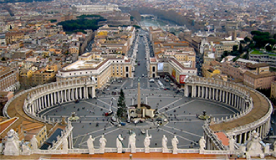 One of the most beautiful and famous public plazas in the world, St. Peter’s Square can hold over 300,000 people. Designed by Bernini, it is encircled by 284 columns. In the center stands a 26-meter tall Egyptian obelisk flanked by two ornate fountains. During the holiday and New Year’s season, a beautiful nativity scene is located in front of the obelisk. The ground upon which St. Peter’s Basilica stands was once an ancient Roman chariot racing stadium. According to tradition, an early Christian church was built here over the tomb of the martyred Apostle Peter. Today’s basilica took over 150 years to complete and reflects designs of Renaissance artists including Raphael, Maderno and Michelangelo. It is the largest church in the world.